TissueScan™ Cancer and Normal Tissue cDNA Arrays are developed for differential gene expression analysis and validation among hundreds of different human tissues in less than two hours. Tissue cDNAs of each array are synthesized from high quality total RNAs of pathologist-verified tissues, normalized and validated with ß -actin in two sequential qPCR analyses, and provided with clinical information and QC data. Bladder Cancer cDNA Array I 24 samples covering bladder cancer four stages and normal tissues. Available in 2, 5, 10 identical plates. Brain Cancer cDNA Array I 48 samples covering brain cancer four stages and normal tissues. Available in 2, 5, 10 identical plates. Breast Cancer cDNA Array I 48 samples covering 7-normal, 10- Stage I, 13-IIA, 7-IIB, 8-IIIA, 3-IIIC. Available in 2, 5, 10 identical plates. New! ER, PR and HER2 in Clinical Info. Breast Cancer cDNA Array II 48 samples covering 5-normal, 11-Stage I, 8-IIA, 6-IIB, 8-IIIA, 2-IIIB, 4-IIIC, 4-IV. Available in 2, 5, 10 identical plates. Breast Cancer cDNA Array III 48 samples covering 12-Stage I, 6-IIA, 10-IIB, 7-IIIA, 3-IIIB, 5-IIIC, 5-IV. Available in 2, 5, 10 identical plates. Breast Cancer cDNA Array IV 48 samples covering 4-normal, 2-Stage I, 15-IIA, 9-IIB, 7-IIIA, 4-IIIB, 6-IIIC, 1-IV. Available in 2, 5, 10 identical plates. Cancer Survey cDNA Array 384 - I 381 samples covering 22 different cancers. Available in 2, 5, 10 identical plates. Cancer Survey cDNA Array 4X96 - III CSRT102 in 96 well format: 381 samples covering 22 different cancers. Available in 2, 5, 10 identical plates. Cancer Survey cDNA Array 96 - I 96 samples covering 8 different cancers: Breast, Colon, Kidney, Liver, Lung, Ovarian, Prostate, Thyroid. Available in 2, 5, 10 identical plates. Cancer Survey cDNA Array 96 - II 96 samples covering 8 different cancers: Bladder, Crohns, Endometrium, Gastroesophogeal, Lymphoma, Melanoma, Pancreas, Scarcoma. Available in 2, 5, 10 identical plates. Colon Cancer cDNA Array I 48 samples covering 5-normal, 6-Stage I, 14-IIA, 3-IIB, 1-II, 3-IIIA, 3-IIIB, 3-IIIC,5-III, 5-IV. Available in 2, 5, 10 identical plates. Colon Cancer cDNA Array III 24 matched pairs (48 samples) covering 24-normal, 5-Stage I, 5-IIA, 2-IIB, 2-IIIA, 3-IIIB, 2-IIIC, 1-III, 4-IV. Available in 2, 5, 10 identical plates. Colon Cancer cDNA Array IV 48 samples covering 8-normal, 5-Stage I, 8-IIA, 1-II, 1-IIIA, 6-IIIB, 3-IIIC, 6-III, 10-IV. Available in 2, 5, 10 identical plates. Colon Cancer cDNA Array V 48 samples covering 6-normal, 3- Stage I, 14-IIA, 2-IIB, 8-IIIB, 8-IIIC, 7-IV. Available in 2, 5, 10 identical plates. Crohn's/Colitis cDNA Array I 48 samples covering 6-normal, 21-Crohn's, 21-Colitis. Available in 2, 5, 10 identical plates. Crohn's/Colitis cDNA Array II 47 samples covering 7-normal, 14-Crohn's, 26-Colitis. Available in 2, 5, 10 identical plates. Drosophila Normal cDNA Array 12 samples covering Drosophila normal and embryonic tissues. Available in 2, 5, 10 identical plates. Endometrial Cancer cDNA Array I 48 samples covering 6-normal, 3-Stage IA, 3-IB, 3-IC, 2-IIA, 6-IIB, 12-IIIA, 7-IIIC, 1-IVA, 3-IVB, 2-IV. Available in 2, 5, 10 identical plates. Endometrial Cancer cDNA Array II 48 samples covering 8-normal, 4-Stage IA, 4-IB, 4-IC, 2-IIA, 4-IIB, 1-II, 3-IIIA, 10-IIIC, 1-IVA, 3-IVB, 4-IV. Available in 2, 5, 10 identical plates. Gastroesophageal Cancer cDNA Array 48 samples covering 6-normal, 1-Stage IA, 2-IB, 7-I, 2-IIA, 4-IIB, 3-II, 2-IIIA, 10-III, 5-IV, 6-GIST. Available in 2, 5, 10 identical plates. Head and Neck Cancer cDNA Array I New! 48 samples covering 9-normal, 2-I, 10-II, 1-III, 16-IV, 3-Tonsil Hyperplasia, 7-N/R. Includes squamous cell carcinoma, epiglottis, larynx, neck, nose, pharynx, salivary gland, tonsil, tongue & trachea. Available in 2, 5, 10 identical plates. Human Brain cDNA Array 24 samples covering all major human brain normal tissues at different locations. Available in 2, 5, 10 identical plates. Human Normal cDNA Array 48 samples covering all major human normal tissues at different locations. Available in 2, 5, 10 identical plates. Kidney Cancer cDNA Array I 48 samples covering 7-normal, 21-Stage I, 6-II, 8-III, 6-IV. Available in 2, 5, 10 identical plates. Kidney Cancer cDNA Array II 48 samples covering 9-normal, 10-Stage I, 5-II, 13-III, 11-IV. Available in 2, 5, 10 identical plates. Liver Cancer cDNA Array I 48 samples covering 8-normal, 7-Stage I, 8-II, 8-IIIA, 3-IV, 13-Lesion, 1-N/R. Available in 2, 5, 10 identical plates. Lung Cancer cDNA Array I 48 samples covering 8-normal, 4-Stage IA, 16-IB, 2-IIA, 12-IIB, 3-IIIA, 2-IIIB, 1-IV. Available in 2, 5, 10 identical plates. Lung Cancer cDNA Array II 48 samples covering 5-normal, 15-Stage IA, 10-IB, 4-IIA, 2-IIB, 5-IIIA, 5-IIIB, 2-IV. Available in 2, 5, 10 identical plates. Lung Cancer cDNA Array III 48 samples covering 8-normal, 6-Stage IA, 6-IB, 3-IIA, 8-IIB, 5-IIIA, 5-IIIB, 7-IV. Available in 2, 5, 10 identical plates. Lung Cancer cDNA Array IV 24 matched pairs (48 samples) covering 24-normal, 4-Stage IA, 4-IB, 2-IIA, 8-IIB, 3-IIIA, 2-IIIB, 1-IV. Available in 2, 5, 10 identical plates. Lung Cancer cDNA Array V 48 samples covering 7-normal, 6-stage IA, 5-IB, 13-IIB, 7-IIIA, 7-IIIB, 3-IV. Available in 2, 5, 10 identical plates. Lymphoma cDNA Array I 48 samples covering 6-normal, 8-Stage IE, 24-I, 4-IIE, 2-II, 4-IV. Available in 2, 5, 10 identical plates. Lymphoma cDNA Array II 48 samples covering 6-normal, 7-Stage IE, 17-I, 1-IIB, 8-IIE, 4-II, 1-III, 3-IV, 1-N/R. Available in 2, 5, 10 identical plates. Melanoma cDNA Array I 43 samples covering 3-normal, 1-Stage IIIA, 6-IIIB, 4-IIIC, 10-III 19-IV. Available in 2, 5, 10 identical plates. Melanoma cDNA Array II 40 samples covering 3-normal, 1-stage IIIA, 3-IIIB, 2-IIIC, 9-III 22-IV. Available in 2, 5, 10 identical plates. Mouse Developmental cDNA Array 48 samples covering mouse normal and embryonic tissues at five stages (3 embryo, 1 post natal and 1 adult). Available in 2, 5, 10 identical plates. Mouse Normal cDNA Array 36 samples covering all major mouse normal and embryonic tissues. Available in 2, 5, 10 identical plates. Ovarian Cancer cDNA Array I 48 samples covering 7-normal, 7-Stage IA, 3-IB, 5-IC, 1-I, 2-IIB, 1-IIC, 2-IIIA, 7-IIIB, 8-IIIC, 2-III, 3-IV. Available in 2, 5, 10 identical plates. Ovarian Cancer cDNA Array II 48 samples covering 8-normal, 3-Stage IA, 3-IB, 2-IC, 3-IIA, 4-IIB, 2-IIC, 4-IIIA, 4-IIIB, 6-IIIC, 3-III, 6-IV. Available in 2, 5, 10 identical plates. Ovarian Cancer cDNA Array III 48 samples covering 6-normal, 9-Stage IA, 2-IB, 3-IC, 3-IIB, 1-IIC, 1-II, 3-IIIA, 6-IIIB, 12-IIIC, 1-III, 1-IV. Available in 2, 5, 10 identical plates. Ovarian Cancer cDNA Array IV 48 samples covering 6-normal, 5-Stage IA, 1-IB, 1-IC, 1-IIB, 4-IIIA, 6-IIIB, 21-IIIC, 2-III, 1-IV. Available in 2, 5, 10 identical plates. 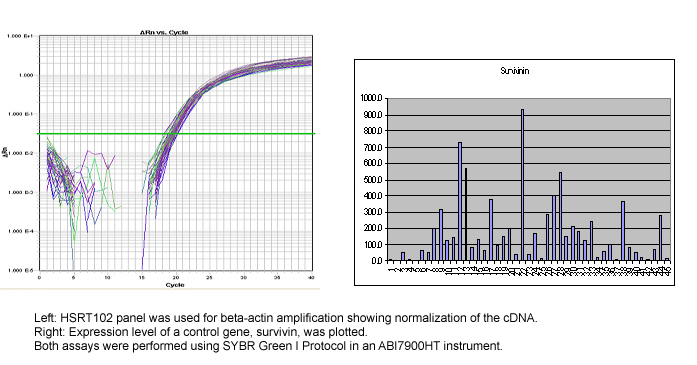 Pancreatic Cancer cDNA Array I 23 samples covering 4-normal, 2-Stage IB, 2-IIB, 2-III, 13-N/R. Available in 2, 5, 10 identical plates. Prostate Cancer cDNA Array I 48 samples covering 7-normal, 7-Stage II, 3-III, 31-N/R. Available in 2, 5, 10 identical plates. Prostate Cancer cDNA Array II 48 samples covering 8-normal, 22-Stage IIA, 11-III, 2-IV, 5-N/R. Available in 2, 5, 10 identical plates. Prostate Cancer cDNA Array III 48 samples covering 9-normal, 18-Stage II, 19-III, 2-IV. Available in 2, 5, 10 identical plates. Rat Normal cDNA Array 46 samples covering major rat normal and embryonic tissues. Available in 2, 5, 10 identical plates. Sarcoma cDNA Array I 48 samples covering 8-normal,1-Stage IB, 4-I, 1-IIA, 2-IIB, 8-II, 1-IIIC, 7-III, 2-IVA, 8-IV, 6-N/R. Available in 2, 5, 10 identical plates. Sarcoma cDNA Array II 45 samples covering 5-normal, 2-Stage IB, 2-I, 1-IIA, 4-IIB, 3-II, 4-IIIA, 1-IIIB, 1-IIIC, 9-III, 1-IVB, 5-IV, 7-N/R. Available in 2, 5, 10 identical plates. Thyroid Cancer cDNA Array 48 samples covering 5-normal, 16-Stage I, 6-II, 16-III, 3-IVA, 1-IVC, 1-IV. Available in 2, 5, 10 identical plates. If your thermocycler is not listed or you would like to convert arrays from 96-well to 384-well format, OriGene offers custom TissueScan™ cDNA array service with your specific PCR microplates for a small service fee. Please fill this custom TissueScan array request form.